Most of us like to hear our audio creations through various types of monitors and headphones to accurately assess how they sound in different listening environments. To do this, we need a simple way to switch to different listening devices. Otherwise, we are constantly re-patching speakers and phones. This where a monitor controller comes in. 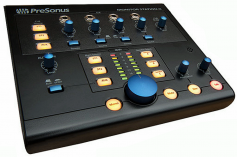 A professional monitor controller allows a certain monitor group to be accessed with the push of a button. Then it allows the easy control of volume. Many manufacturers make monitor controllers of various quality levels and functionality. One pro audio dealer in New York City, B&H Photo Video, recently listed what it considers the best monitor controllers on the market. Included are names like Antelope, Dangerous Music, ESI, Grace Design, Heritage Audio, JBL, Mackie, Palmer, PreSonus and SPL. All of B&H’s recommended monitor controllers are small, lightweight and portable. Most are also are also passive, requiring no power. A lack of active circuitry means non-powered controllers can’t drive headphones. They output line level audio for connection to power amps or active speakers. First up is the Mackie Big Knob Passive ($69.99), a 2 x 2 unit about the size of an open hand. It has two sets of ¼-inch inputs and outputs that accommodate unbalanced or balanced equipment. A 3.5mm input is present should music need to be checked out from a mobile device. Operations are simple, thanks to buttons for source and monitor selection, mono, mute and dim, plus a large volume knob. The ESI MoCo ($89.95) starts with a similarly sized enclosure and big-knob design, then expands functionality and connection types for people with slightly more complex needs. The device’s left/right swap functionality is a nice bonus, in addition to the expected switches for input and output selection, mute and mono/stereo mode. The next two models can function as passive speaker controllers, but include power supplies for operation of built-in headphone amplifiers and LED indicators. This makes them active. A little larger than the Big Knob Passive and MoCo is the JBL M-Patch 2 ($134.00), which offers 3.5mm, RCA, XLR and ¼-inch inputs. Separate stereo/aux volume controls allow easy level-matching between sources. It has two pairs of balanced XLR outputs and a front-panel ¼-inch headphone output with its own level knob. Also on the front panel are switches for mono, mute and I/O selection, each with a dedicated LED indicator. The Palmer Monicon L ($269.99) features nearly identical inputs, outputs and functionality as those on the M-Patch 2. However, its always-active mono XLR output — fine for a subwoofer — and independent source selector for the headphone output give it added versatility in recording and mixing scenarios. The next four products expand flexibility while remaining moderately compact for desktop setups. The PreSonus Monitor Station V2 ($299.95) has facilities for three sources (including one S/PDIF digital), three pairs of monitor outputs with separate trims, line outputs and four headphone outputs. It has a talkback function, stereo meters and a level-adjustable dim, as well as a main volume knob, mono and mute. Like the Monitor Station V2, the Heritage Audio RAM System 2000 ($899.00) has three sets of monitor outputs, talkback functionality and stereo meters. It also features a 64-step master level control, a dedicated subwoofer output, two headphone outs and five stereo inputs. It features three ¼-inch pairs, one S/PDIF and Bluetooth. The SPL 2Control ($899.00) features two stereo inputs, two stereo monitor outputs and two independent headphone outputs. It has a selectable mono output, acknowledging the common demand for a subwoofer or separate mono speaker. The special power of the 2Control is its crossfeed feature, which provides adjustable “bleed” between headphone channels to simulate the stereo imaging experienced when listening to speakers in a room. Another is the Dangerous Music Source ($899.00). Its two headphone outputs and two pairs of speaker outputs are fed by independent input selectors and precise level controls. Choose from four stereo sources — two analog, one AES3 or S/PDIF and one USB. The digital inputs are routed through mastering-grade, high-resolution D/A conversion to the analog outs. Use the extra line outputs for external meters or a mixdown recorder. These last two controllers are designed for mounting in a standard 19-inch equipment rack. They come with full-featured desktop remotes that need a single cable. The versatile Antelope Satori ($1,995.00) occupies one RU. It has eight stereo inputs, four stereo monitor outputs and four stereo headphone outs sound? The Satori’s rear panel also has a subwoofer output and stereo sum outputs, which can receive a user-selected combination of input sources. There is a talkback function, built-in talkback mic and external talkback mic input. All users will appreciate the 0.5 dB source/destination offset trim ability and 0.05 dB stereo accuracy. Finally, there is the Grace Design m905 ($3,510.00), available in silver or black. This two RU mastering-grade monitor controller has a deceiving front panel, offering just a power switch and one lonely headphone output. On the rear, there are three pairs of speaker outputs, balanced and unbalanced analog inputs, AES3 I/O, S/PDIF I/O, an ADAT optical input, and a USB Type-B input. Also there are cue inputs and outputs, word clock I/O, talkback I/O, and two sub/DAC outputs — assignable as sends to subwoofers, a stereo mixdown recorder or outboard meters. The remote unit adds another headphone output with a cross-feed option, and a built-in configurable SPL meter. Find a monitor controller that fits the size and needs of your studio. They can positively affect workflow, speed and results and are a “must have” if you monitor audio with several speaker sets.